When David Servan-Schreiber, a dedicated scientist and doctor, was diagnosed with brain cancer, his life changed. Confronting what medicine knows about the illness and the little-known workings of his body’s natural cancer-fighting capabilities, and marshaling his own will to live, Servan-Schreiber found himself on a fifteen-year journey from disease and relapse into scientific exploration and, finally, to health. 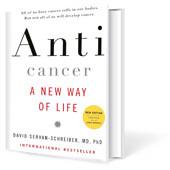 Combining memoir, concise explanation of what makes cancer cells thrive and what inhibits them, and drawing on both conventional and alternative ways to slow and prevent cancer, Anticancer is revolutionary. It is a moving story of a doctor’s inner and outer search for balance; radical in its discussion of the environment, lifestyle, and trauma; and compelling and cautionary in its proposal that cancer cells lie dormant in all of us—and that we all must care for the “terrain” in which they exist.